Of all the many heater types available, indoor kerosene heaters possibly offer the biggest range in terms of heat output and usage. At one end of the scale, you have smaller kerosene heaters which are ideal for indoor environments such as lounges, dining rooms, and offices. At the other end, there are larger indoor kerosene heaters which are more suitable for larger environments such as factories, warehouses and other larger buildings where heating is required. In this article we will look at three different kerosene heaters in each of the two categories we have mentioned, and highlight their most important features in order to help you choose the one which is right for you. Heats areas over 3,100 sq. ft.
Heats areas over 3,200 sq. ft. This box-shaped kerosene heater from Sengoku is ideal for anyone who needs to heat indoor areas of up to 380 square feet. These could either be inside the home or in buildings such as a garage or workshop. It is also suitable when you need an emergency heating solution should your main heating source ever fail. Using the heater is very simple, provided you follow the relevant safety guidelines for the use of kerosene. Batteries are included which allow you to easily start the heater using the electronic ignition, and once it is lit, you then have the means to adjust the heat level to a high or low setting depending on your needs. Safety features include an automatic cut-off switch if carbon monoxide levels increase and it will also switch off should the heater accidentally get knocked over. The fuel tank holds 1.2 gallons of kerosene which should be enough to keep the heater working for up to 14 hours, although this will be dependent on the heat setting selected. There's nothing complicated about using this heater albeit the instruction book is poorly written. Despite this, it lights easily by pressing the start button for the battery-powered electronic ignition. Once it is on, selecting the level of heat in the room is achieved using the large dial which adjusts the wick. To help you track fuel depletion, there is a welcome and useful fuel gauge. For safety, the heater has a carbon monoxide detector, and should levels increase beyond a safe level, the heater will switch off. There's also a safety cut-off in the event of the heater being knocked over. This is another kerosene heater which is capable of heating small to medium indoor rooms, which includes garages and larger workshops up to an area of 1,000 sq. ft. It can also come to the rescue should you need an emergency heat source, either at home, in an office or even in commercial properties such as a store or small warehouse. Given that it can be used in several different scenarios, safety is paramount, especially as there is the potential for several people to be in the vicinity of the heater. The most important feature is the auto-cut off should carbon monoxide levels increase. Should the heater get kicked over by someone it will also shut down. Finally, the heater has a protective cage to prevent anyone (especially children) from touching the hot parts close to the wick. Operating the heater is very easy, with a simple press of the electronic ignition starter button all that is required to get the heater up and running. Once this has been done, the heat can be adjusted using the control dial on the side. We come now to those kerosene heaters designed for larger indoor areas, and our first candidate is this one from Mr. Heater which pumps out an impressive 125,000 BTUs. At that level, it can heat an area over 3,100 square feet which means larger workshops, small factory units, and many medium and large warehouses could all be heated by it. With an 8.5-gallon capacity kerosene fuel tank it can produce heat for up to 9 hours, and therefore it will heat commercial and industrial premises for 1 or 2 working days. It can also be relocated from building to building thanks to the fact that it sits on a wheeled frame which allows it to be moved easily. The only requirement is that the room or building must have a power outlet. Operating this kerosene heater is as easy as it gets. One press of the electronic ignition switch will be enough to start it, and thereafter you can adjust the heat output using the thermostat dial. 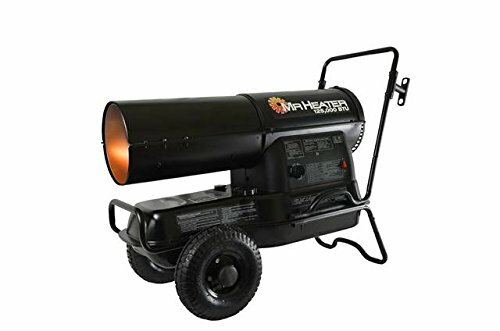 If you are looking for a forced air kerosene heater that can heat a large area, then this offering from Pro-Temp is certainly worth considering. The output of 125,00 BTUs along with the electric fan blowing that hot air into the building means it will heat an area of up to 3,100 sq. ft. This gives it the potential to heat several different types of industrial and commercial premises for up to 10 hours on a full tank of kerosene. As with most heaters of this type, it has electronic ignition, so you can start it right away. The thermostat dial lets you select the desired heat level, and adjust it as needed. One great feature is the LED display which lets you see what the temperature is. This display can also be used for diagnostic purposes should the heater ever develop a fault. Moving a heater this size isn't normally easy, but with a strong metal carrying frame, it can be wheeled from location to location with the minimum of effort. Another convenient feature is the fuel gauge which lets you see when the kerosene tank needs refilling. Our final indoor kerosene heater is this one from Dyna-Glo which produces the highest heat output of any of the ones we have looked at. 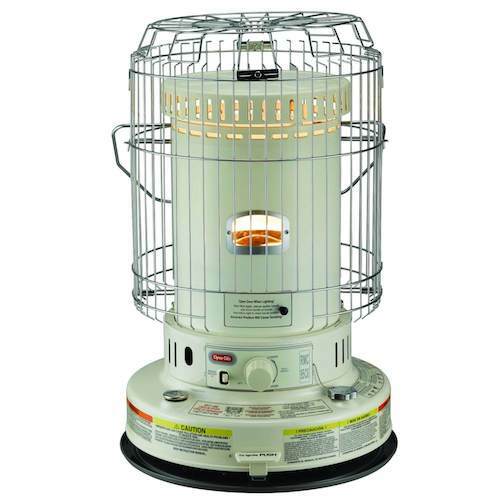 At 135,000 BTUs this heater can heat up to 3,200 feet which gives you plenty of options as to where it could be used. On the subject of options, this heater also gives two in respect of the heat output. You have the higher one of 135,000 which we've just mentioned, but you can also set it to 95,000 BTUs. This means you can lower the heat should those in the vicinity start to feel the area is getting too hot. The lower setting also reduces fuel consumption which is why this heater can give you up to 14 hours running time on a full 10-gallon tank of kerosene fuel. You can track fuel usage using the fuel gauge located on the heater's base. That wheeled base has both a front and a rear handle which means moving the heater around is very easy. If used properly kerosene should pose no health or safety issues, but given that it is a combustible fuel, it still presents a number of risks which you should be aware of. It is also important that you understand how to mitigate these risks so that you, and any others who may come close to your kerosene heater, are safe at all times. There are four health concerns in relation to kerosene. The first relates to swallowing or ingesting it, secondly, there's inhaling any fumes it gives off, and third, there are potential skin problems should you accidentally come into contact with it. The fourth is one that applies to many fuels which are used as heat sources and not just kerosene, and that is carbon monoxide poisoning. If ingested, kerosene can be fatal, and we trust you would never deliberately swallow kerosene, so we include this section with regards to small children who are the most likely victims. Given, that to a child, kerosene in a small container might be mistaken for something they can drink it is vital that you keep kerosene stored well away from any area that a child could access. While not as dangerous as ingesting, the amount of time that you are breathing in air which has kerosene fumes should be kept to a minimum. If you breathe in too many kerosene fumes it can cause nausea or dizziness and the later could cause a secondary risk if this were to happen in an industrial facility. Long-term exposure to kerosene fumes can lead to kidney damage and blood clots which can negatively impact the health of your heart or brain. We hope you are already aware that you should avoid as much as possible your skin coming into contact with kerosene. If it should occur, then wash it off as soon as possible. If you don't you run the risk of skin irritation and another issue that frequently occurs is eye irritation due to someone rubbing their eye with unwashed hands that have kerosene on them. Whether your use kerosene or another type of heater fuel, such as propane, there is a risk that the amount of carbon monoxide (CO) they create as part of the fuel burning process increases to a dangerous level. This can be especially risky in small, enclosed spaces, with no ventilation. As carbon monoxide is poisonous, there is an obvious risk to life if someone is in the room as these levels of CO increase. For this reason, all heaters which burn fuel must have a CO level detection system which switches the heater off if it detects CO levels increasing. Always check for this when buying a heater and never attempt to tamper with any safety cutoff switches it has. A lot of the health and safety risks can be avoided by using common sense at all times, but there is another way to eliminate a lot of them, especially with regards to ingesting it, and that is by storing kerosene correctly. First, it should be kept away from the house if possible, so a garage, workshop, or garden shed is ideal. If you have a lockable cupboard in any of these locations, then that's even better. Further to this, always store it in a container that has been designated as safe for storing kerosene. You should also mark any container clearly so that no one can be in any doubt about what is inside it. The final point we want to make about storing kerosene is that you should only really do so for a maximum of two to three months. After that period of time kerosene has a tendency to break down, absorb water and is even prone to bacteria and mold. Ideally, you should only buy enough kerosene that will be needed for a few weeks or so, rather than stocking up with large quantities to last the whole winter. It is fair to say that depending on where you live, that there will times of the year when you will have no need for any heating, including any kerosene heater which you may have. For many types of heaters such as electric baseboard, ceramic or infrared, you simply switch them off and forget about them. However, that is not the case when it comes to heaters that use kerosene. With a kerosene heater, it is recommended that it is stored away during periods that it will not be needed. This prevents any potential fire risks in relation to unused kerosene fuel that may still be in the fuel tank. Preferably you should ensure all the fuel has been used before you store the heater. Apart from the safety aspect of this, unused fuel will start to degrade after three months. When you next try to light the heater, there is the potential that this older fuel may damage it. For smaller indoor kerosene heaters, you should determine where you are going to locate it and ensure it's not anywhere that someone is likely to fall over it. Do not place it where it could get knocked over, such as adjacent to a door. You'll also want to keep it a reasonable distance away from items like drapes or furniture made from fabric. Larger kerosene heaters, which you may be planning to use in commercial or industrial buildings, will need a power source. Make sure that the power cable can be run from the outlet to the heater without creating a trip hazard. As larger kerosene heaters can be moved using their wheeled frame, you may need to assess this for any location the heater could potentially be moved to. You'll want to ensure that the kerosene heater you purchase has enough heat output for the indoor area it is being purchased for. As you know all these heaters are rated by their BTU output and this can range from 10,000 BTUs all the way up to over 200,000 BTUs. The key is to select one that has a rating which is neither too low nor excessively too high. The way this is done is by first measuring the size of the room or indoor area the heater is going to be used in. For this, you'll want to measure the dimensions of the room (width and length) and multiply them together to calculate the area in square feet. For example, if you have a room which is 25 feet long and 15 feet wide, the floor area of that room is 25 x 15 which is 375 square feet. You then take this figure, and for every square foot you will need 20 BTUs to heat it. In our example 375 x 20 comes to 7500, so a 10,000 BTU kerosene heater would be required. This also applies to larger floor areas that you might find in a small warehouse or factory. If we had a building that was 60 feet long by 50 feet wide, the area is 3,000 sq. ft. In this scenario, we would want a heater with at least 60,000 BTUs output. We hope our review of kerosene heaters for indoors has been useful, and that our buyer's guide has helped answer some of the questions you may have had. At this point, we usually select a single product which we believe is our #1, but as we looked at three small and three large output kerosene heaters, we are going to pick one from each type. 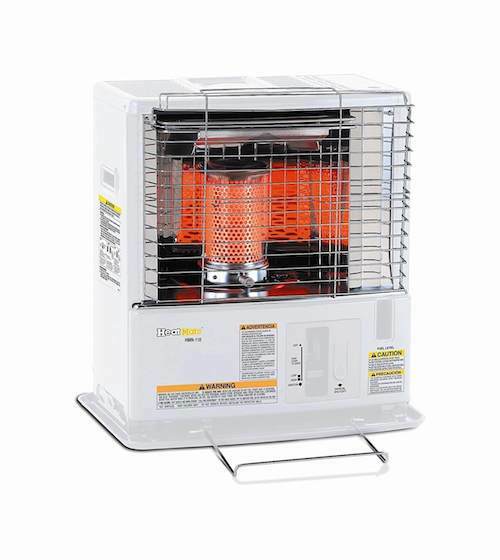 For the smaller kerosene heaters which are suitable for domestic and office use, we have chosen the Dyna-Glo RMC-95C6 Indoor Kerosene Convection Heater. It is a compact heater that produces 23,000 BTUs, which is impressive for its size. It is capable of heating up to 1,000 square foot areas so even larger offices or workshops could be heated by it. A full tank lasts for up to 12 hours, so you'll get at least 1-2 day's use, and it is also light enough to be easily moved to a different location if needed. For the larger kerosene heaters, we have selected the Dyna-Glo Delux Forced Air Heater. While many of the specifications in terms of heat output, area and time were similar to the others, the fact that this gives you an option to reduce the heat output gives it the edge.